Visit the East End of Long Island now and into autumn for a lingering taste of summer! Though the past few days have been rather dismal downstate, the beaches of Long Island have more to offer after Labor Day than you might think. Right about now, farmers are harvesting tartly sweet beach plums to render into batches of jams, jellies and sauces and to bake into treats. Go enjoy them and you’ll be helping to carry a splendid natural and culinary heritage forward. I’m thrilled that as I LOVE NEW YORK’s 2011 “Greenest New Yorker” I might become one of the purplest too. My $500 award from Escapemaker.com will be directed to the Greenhouse Project to grow beach plum seedlings that can be donated to schools, community gardens and other public spaces. This new effort parallels my championing of the Newtown Pippin apple. 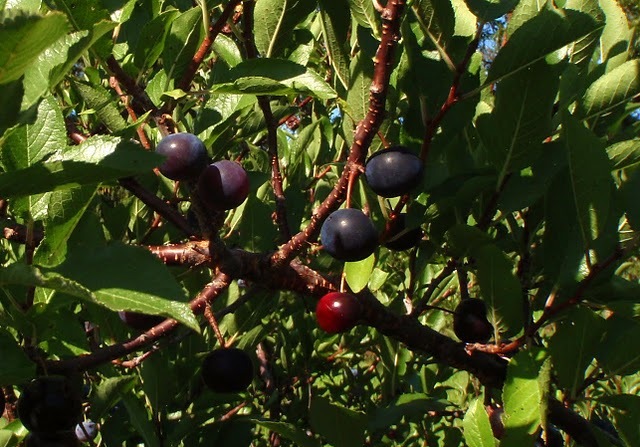 Beach plums are indigenous to the east coast of North America. They play an important role in stabilizing dunes and feeding wildlife. Explorers Giovanni da Verrazzano and Henry Hudson wrote of the beach plums lining what’s now known as New York Harbor. 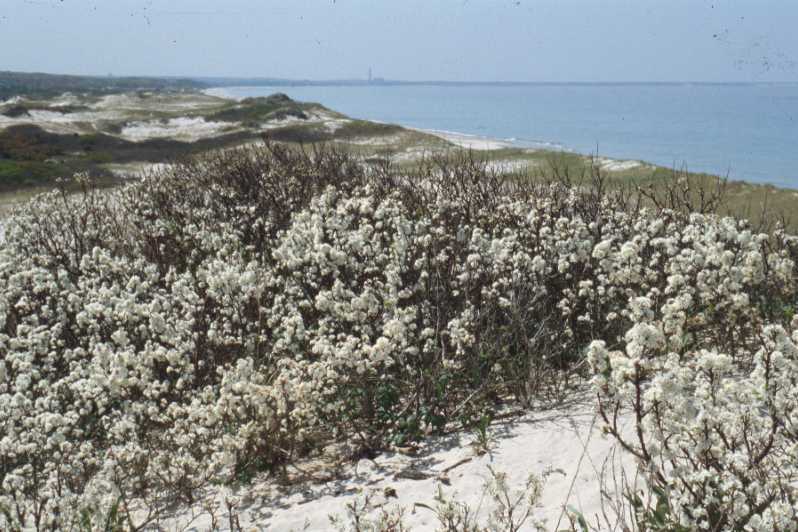 It’s hard to miss these bushes, which are resplendent in white blossoms in late May and thick with green leaves and cherry-sized fruits in late August. 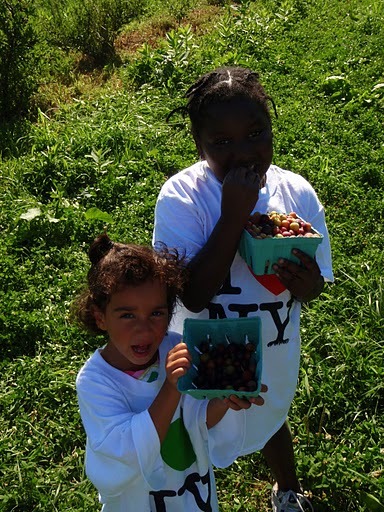 Today in New York State you’ll find wild beach plums on Long Island, Fishers Island and Shelter Island. Habitat restorations surrounding Jamaica Bay incorporate beach plums and several New York City waterfront parks feature small plantings. I first learned of beach plums from David Lutz of Friends of Gateway, a volunteer group that grows beach plums and other native plants. They do well at the New York State Tree Nursery in Saratoga Springs, which lies between the territories of beach plums and another of New York State’s edible wild fruits, the Great Lakes sandcherry. 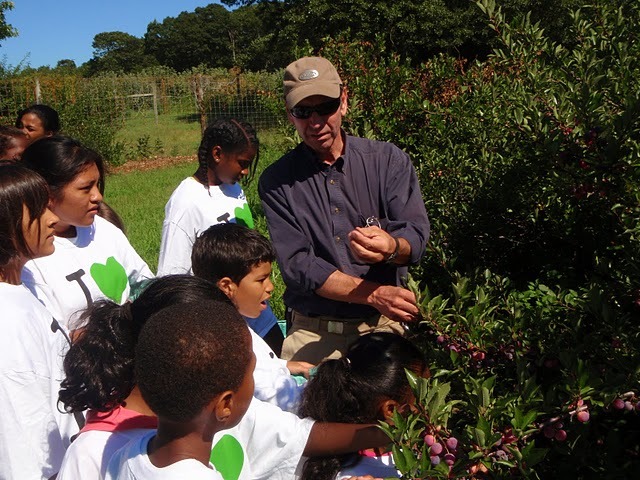 Cornell University researchers helped spark a beach plum revival by helping farmers to master new growing techniques and markets. 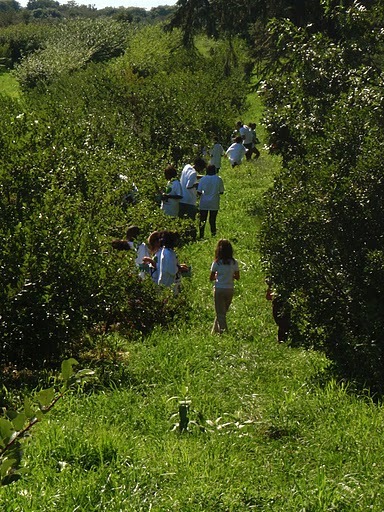 I recently brought a group of 20 kids from Hour Children to visit Briermere Farms, a 300-acre rolling expanse of orchards and cropland in Riverhead, NY. Owner Clark McComb introduced the kids to beach plums and to healthy treats like peach slushies made from fruits he grew himself. Landscape designer Gil Lopez, who greatly helped with our trip, was inspired to include beach plums in his palate for sustainable gardens. To see a full gallery of our trip, click here. Pits made from fruit we picked will be germinated by the Greenhouse Project. In addition to the expertise Cornell University and Friends of Gateway offer, staff at the NYC Department of Parks and Recreation’s Greenbelt Native Plant Center have always been very helpful to my green efforts. Stay tuned for more info about an upcoming Beach Plum Week in Long Island City. It is in the works for September, with local restaurants selling gelato, smoothies, tarts, martinis and other delectables. Proceeds will benefit the Hour Children food pantry. 4/30 - I LOVE NEW YORK's 2011 Greenest New Yorker winner will be unveiled at Escapemaker.com's Green Getaways, Local Food & Travel Expo this Saturday! 5/1 thru 5/4 - Check out the Solid Waste and Recycling Conference at the beautiful Sagamore Hotel in Lake George. 5/21 - Join your community at spring It's My Park Day at parks all across the city and help get your park in shape for summer! Rip Van Winkle Never Imagined Living So Well! Kids in New York Apple Country! See your Way to the Seaway and Harborfest!